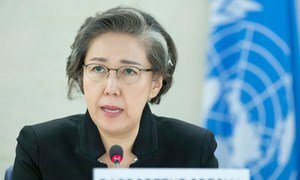 The United Nations today welcomed the release of the final report of an independent advisory body looking into the situation in Myanmar's Rakhine state. “We welcome the release of the comprehensive report of the Advisory Commission on Rakhine state and take note of its emphasis on issues related to identity and citizenship, particularly its call for freedom of movement for all people,” said UN Spokesman Stéphane Dujarric at today's regular press briefing in New York. “We look forward to reviewing the report's recommendations further,” Mr. Dujarric continued, saying that in the meantime, the UN recognizes the significance of the Government's establishment of the Commission – which was led by former UN Secretary-General Kofi Annan – and “the importance of its mandate to analyze the situation of all communities in Rakhine state and draft recommendations toward conflict prevention, reconciliation, institution building and long-term development, as well as humanitarian services. Building on the Advisory Commission's interim report, released in March, the final report puts forward recommendations to surmount the political, socio-economic and humanitarian challenges that currently face Rakhine State. The report is the outcome of more than 150 consultations and meetings held by the Advisory Commission since its launch in September 2016. Its members have travelled extensively throughout Rakhine state, and held meetings in Yangon and Naypyitaw, Indonesia, Thailand, Bangladesh and Geneva.